These boatnotes are intended to be helpful for people who borrow Cribbit but also contain details of how to operate locks and cruise the canals generally. The latest version of these notes is available on-line at www.cribbit.net/boatnotes.php. Printed copies, of varied provenance, are also kept in the current year's log book and in the 'Boatnotes' file on board. Official paperwork: Insurance certificate, cruising licence etc are kept in the Paperwork and Boat Notes file. With my move 'onto the land' and conversion to a cruising rather than live-aboard mode, there have been a lot of changes on Cribbit. Some have been made necessary by my no longer having a land-based mains connection and others through a 'process of continuous improvement' and the most recent due to sinking at Great Bedwyn and the collateral damage this has caused. Many of the pics are no longer relevant. There are divers switches and meters all over the boat and most of them have a purpose though not all and some are of more use than others. From the left: There is a vertical column of two electric sockets and a clock. Top socket: 3 pin rectangular which supplies 240 volts at up 1kw when the inverter is switched on. Bottom socket: 3 pin round which supplies 12 volts from the domestic battery. Clock:Usually set to BST but check. On the top row:There is a keyswitch for the engine electrics this must be on in order to start the engine. [The inside engine electrics switch must also be on for this to work as well]. Next is an hour meter and a toggle switch marked 'meters' This switch enables the battery monitoring LED banks, and should be switched off when leaving the boat. Three push button switches which are used for starting the engine. See the engine section below for detail as to how they are used. Glo: This powers the glowplugs, which warm the engine block so that the diesel will ignite. Start: Activates cranking of the engine with the starter motor. Magic: Press this if the green indicator light does not go out when the engine is first started. Or rev the engine in neutral. Further along this row are the battery condition monitoring LED banks. The first four show the engine battery. The other two banks indicate the state of charge of the domestic battery. On the third row: are green and red indicator lights. The green indicator goes out when the batteries are being charged and the red is extinguished once the engine oil pressure has reached its minimum safe value. Both indicators should be out when the engine is running. Level with these is a double cigar lighter outlet. One of which should be occupied by a 5volt usb charger adapter for mobile phones etc. On the bottom row: Two round dials: Oil pressure and Engine temperature. 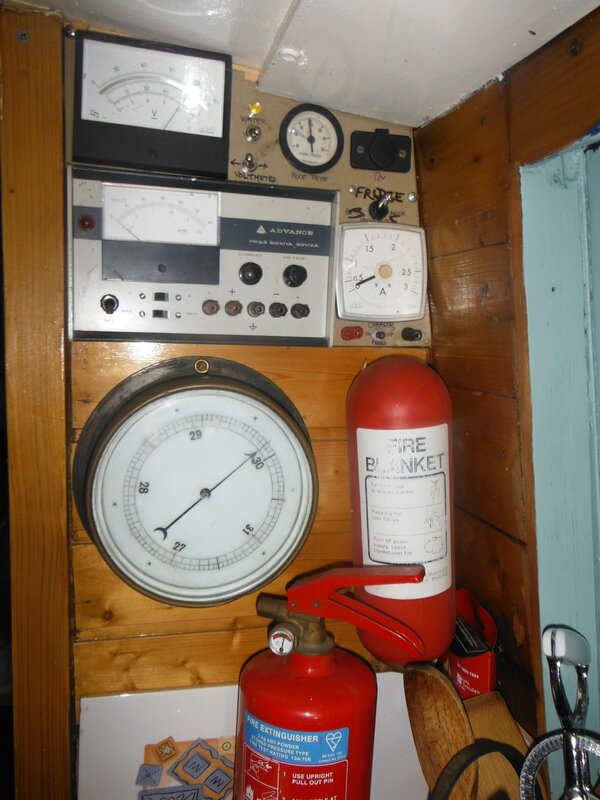 Bilge: Switches on the bilge pump, use this to pump water out of the engine room. Please squirt fairy liquid into the bilge water before using and make sure that the pump is below the water. Light: Switches on the tunnel light. Horn: Pressing this sounds the horn. Whether anyone can hear the horn is a moot point. The PLA book has the meaning of signal horns but hardly anyone will understand what you intend from your properly encoded signals. Best just to sound the horn and hope. Engine stop control: Pull the knob up to stop the engine. Make sure the stop lever is firmy down when trying to start the engine! Battery charger controls: To the right is an antique moving iron meter and a control panel with knob. DON't USE it is part of an auxilliary battery charging system, no longer used. 240 and 12 volt sockets and inverter remote control At the bottom, port side, of the bed is the inverter remote control panel, a 240 volt socket which is connected to the inverter, a double 240volt socket which only works when connected to an external supply and a 12volt socket with switch. The switch gives a lovely green glow and that's all it does, it is a low consumption green night light. It's not been used in years. Inverter remote control: Depress the switch on the panel and the switch on the socket to get up to 1kw of 240 volts from this socket. 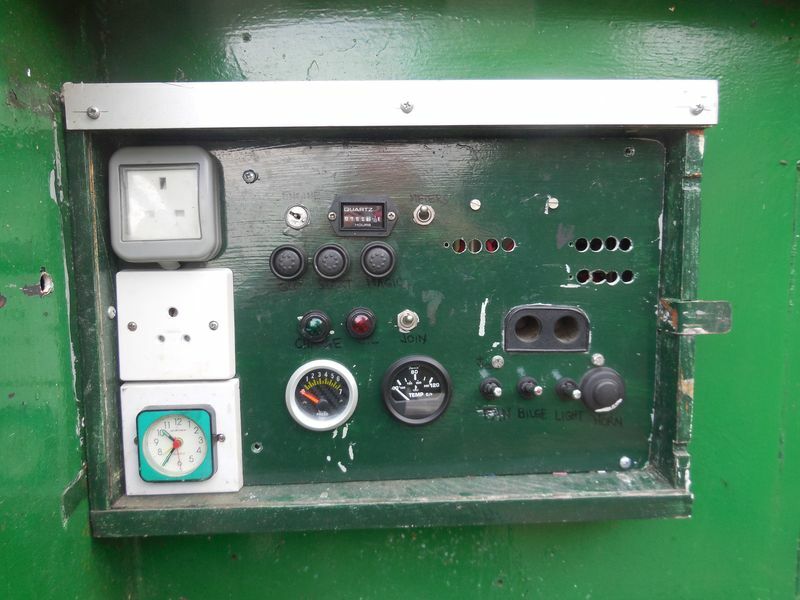 The inverter needs to be powered by activating its isolator switch in the outside stern locker. Ignition/off swich: To ignite the boiler pilot light, press this knob well in and hold for about 12 seconds. You should hear it clicking, the burner will light and the pilot will be ignited. Release the knob and the pilot should remain lit. To turn off the pilot light, press again. Flame height: Marked Lo and Hi, select the setting that works best for the water temperature you want. Temperature: This should allow fine control of the output water temperature. Not working properly at the moment. At the end of the cupboard, over the oven on the port side are several meters and switches, not all are marked! Large voltmeter: Indicates the domestic battery voltage. Red LED indicator on the water pump switch This switches on the water pump for domestic drinking and shower water. Side mounted toggle switch: Switches the voltmeter on and off. Round dial: This gives the temperature on the roof. Cigar lighter socket: 12 volts worth of domestic battery. Refrigerator main switch: Enables power to the refrigerator, warned by a yellow LED on the switch. The next row is a battery trickle charger and a charge level ammeter, neither are used when cruising. Barometer: Well its a barometer. Fire blanket: Good for smothering flames, especially on people. Fire extinguisher: Its a powder one and makes a big mess if used. Isolation switch for the radio: Please switch OFF when you leave. Radio consumes power even when off. This is located by the side of the radio, inside the shower room. Please use when making smells or steam or both. Shower tray pump switch: This is well hidden under the starboard gunwale in the shower cubicle. Use this to pump the shower water out of the shower tray. Cabin lights: The lights all have individual switchs of some sort, try them yourself. The LED lights consume much less power so are the prefered means of lighting. The wise switch off lights that are not being used, others sit in the dark when the battery goes flat. Take your choice. Phone charger: This can be found aa the end of the kitchen worktop, port side. This a 12 volt socket, cigar lighter adapter and multi phone charger adapter. It also gives USB connection so will charge most devices, except Apple. There is a handy shelf to leave your device on while it is being charged. Pam says that John and I can't have a conversation of more than 3 minutes without mentioning batteries! The reason for this is that they are an essential and complex part of living unconnected to the national grid. You will need to read this section to gain inner happiness with your use of the batteries on your trip. There are two sets of batteries. 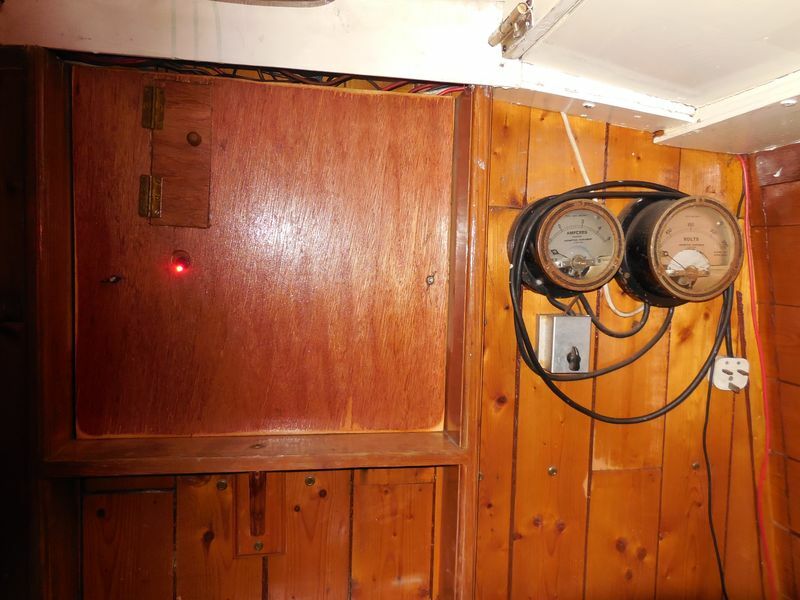 Traction, which is used to start the engine, and domestic which supplies lighting, water pumps, refrigerator and other 'domestic' functions inside the boat. The domestic battery is also the source of power for the homemade 1kW mains supply. I have now fitted an expensive battery management system that does automatically, and better, that which we used to do by hand. 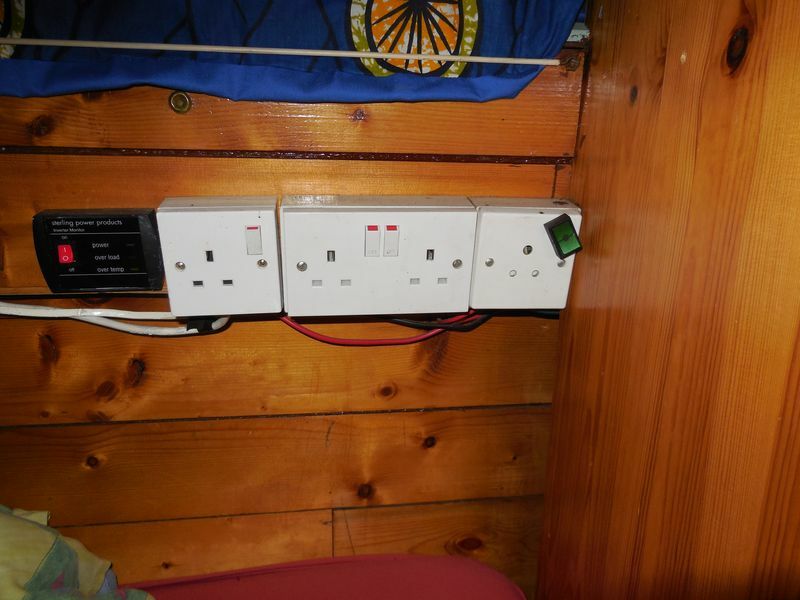 Mains voltage is manufactured by an inverter which supplies one socket at the bottom of the bed in the saloon and a socket by the stern control panel. This is rated at 1kW and will run the white hair dryer comfortably, the black one on low setting only. The charge in the domestic battery will last for about 5 minutes if the engine is not running so do not use unless the engine is running and give the poor battery a chance! I doubt that there is alternator capacity to run the inverter at 1kW for long or to run it and the shower pumps together. I have just fitted a new [and bigger] alternator which is rated at 55 amps which gives just 660watts so running at 1Kw can only be done at the expense of battery power. 1 kilowatt worth of 240 volts AC ['mains'] is provided by the inverter, this converts the 12 volt DC of the batteries into a fake, and messy, equivalent of the 240 volt mains supply. There are two caveats here, first, the waveform of the manufactured mains is far from the perfect sine wave of the mains, so some appliances may not run on it. I have had trouble charging my electric toothbrush for example, which was a terminal experience for the charger, so take care. Second, the battery will not last very long if you try to draw a kilowatt from it without the engine running. Use the inverter power switch in the stern locker to turn on the inverter. The inverter will operate the vacuum cleaner, most power tools and the electric blanket. It will also operate both my hair dryers though not on their high power setting. It is unlikely that it will operate the hair dryer you have brought with you if it is rated above 1kw. I have also fitted a new set of batteries which are fairly forgiving at the moment but won't be for long if exhausted. It is good practice to run the engine whilst using shower or inverter. Coolant: level is about 2 cm from the bottom of the expansion tank. Take care not to overfill as it then blows hot water out until the level is 2 cm from the bottom! Please try not to step on the gear change controls whilst fettling the engine. Disengage drive - by pressing in the central button and then moving the lever fully forward to full throttle. Make sure engine stop lever is well down. If the engine is warm, it should start easily by pressing the starter button. If it is cold, follow the directions below. Press starter button for about 10 more seconds but remember that this is an old diesel engine and will need a lot more cranking than a modern petrol engine. Keep the glo going while you crank. Press the magic button to initiate charging once the engine is running, this is not always needed. If you are really desperate, check that the stern stop lever is down, then squirt Easy Start up the air intake and try again. Easy start cans are in the stern locker. Switch off electrics, inside and outside. Engine is unlikely to turn over with much enthusiasm if the battery voltage is below 12 volts. Engine can be started using the auxilary battery. See auxilary battery section for details. If pumping bilges, add a few squirts of Fairy liquid to cut the bilge oil. Turn stern gland grease gun until grease emerges from the bearing. Grease supply by weed hatch. Battery on/off switches are mounted above the batteries. The gearbox is hydraulic and doesn't work when the oil level is low. If you lose drive, the most likely cause is low oil level in the gearbox. Top it up with engine oil, it has its own filler and level dip stick. Stored with its charger in the outside stern locker. This is available as an alternative to the jenny. Please re-charge from the inverter, when the engine is running, if you use it. If you want 250volts you could use this as the power source for the small, portable inverter. Again please re-charge after use. Connect the red [positive] lead first, then the black. Disconnect in the reverse order, negative then positive. It works best when you connect the positive lead directly to the starter solenoid. Please travel with the front door closed. This is to deflect overspill water into the bow well. It is possible to swamp the boat if water can cascade in through the open door. If you are on a stretch with no locks, then this precaution is unnecessary. Warps attached just forward of the centre of the boat are the most use when manoeuvring through locks etc. and there is one very long warp which is used in deep Thames locks, broad beam locks and when single handing. Narrow locks are not wide enough for boat and wide fenders. You'll get well stuck with these down. Travel with them up and use them when moored. Please keep your speed down when passing moored boats. Usually, you can moor anywhere on the towpath side of the canal, at designated places only on river navigations. The best technique in mooring is to tie up to the Armco shuttering. To do this, insert a mooring pin behind the crash buffer and loop the mooring warp under the pin. Bring the warp up to the top of the pin and secure it with a half hitch, half hitch the bottom part of the warp to the top and run the rest of the warp back on board if it is long enough. Set warps out at about 45 degrees to the boat. Or use my new Armco hooks. Select the place on the pilings to attach the hook, the best places are where the Armco is secured by a bolt to the bank, this will stop the hook getting pulled behind the shuttering, making it difficult to extract later. First tie the stern, or upstream end of the boat, to do this pass the doubled stern warp through the eye of the Armco hook and drop the rest of the hook through the loop, then make fast back on the boat, keep the two ends at the same tension then do figure eight and half hitch to secure on the tee mooring pin. Now do the bow, pass the doubled bow warp through the eye and put the hook in place on the shuttering. Take the doubled warp and drop it over the bow mooring pin on the boat, pull the remaining, single, end tight, bringing the boat up to her mooring. Make fast with figure eight and half hitch. If there is no Armco, then you will need to drive in mooring pins. These should not obstruct the towpath and should be driven in at an angle. It is best to use all three as they are easily pulled out by boy racers on the cut. It is a good idea to half hitch these pins to the warp as they will then stay connected to the warp when they are ripped from the bank by the boy racers. On the GU if you can get them alongside the concrete over capping this will help to hold them firm. I now have one mooring pin with a metal loop top, use this one for the centre warp as this has a vertical rather than lateral load. If leaving the boat un-attended, double up the mooring pins. It's easiest if you put the second one through the loop of the first at right angles to it. I have made flat steel pins that will [just] fit behing the railway line reinforcement found in some places on the Grand Union canal. Drop these behind the rail line and screw in the bolt that prevents the pin from being pulled back out. Mooring to pins can be difficult in the London area. Sometimes there is no soil to put a pin into but the main problem is the number of non-boaters using the canal. These craft will not slow down past moored boats and can easily pull out mooring pins. The solution is to double up pins if you have to use them. It is worth getting the first pin as close as possible to the back of the concrete capping, at an angle of about 45 degrees away from the boat but parallel to the cut. The second pin can then go at right angles to the first and need not be connected to the warp. When the boat won't move forward with much enthusiasm even though the throttle is open AND you get lots of wash - chances are that the propeller is fouled. To clear the propeller, you need to open what is euphemistically called the weed hatch. It is likely that the fouling is due to polythene bags, old carpet, barbed wire etc. Use the mooring hammer to release the grip of the weed hatch cover plate. Unscrew the gripper and slide the mechanism off the hatch to one side. Lift off the hatch cover and reach in the water to remove the fouling from the propeller. Make sure that the hatch cover is firmly screwed down or it will leak, filling the stern with water and possibly swamping the boat. Take care when the water tank is nearly empty as the boat is well down in the stern bringing the water level very close to the top of the weed hatch. If in doubt remove gas bottles to lift stern. Also take care if you have a large crew who all want a look as they will also depress the stern! There are divers windlasses hanging by the saloon door. The popular ones are those with rotating handles and the aluminium Dunstan. Those with long handles are useful on navigations with primitive sluice gear [or for the weak] but watch your knuckles. A good rule is to never let the windlass out of your hand, ie don't leave it on a sluice gear, if the ratchet pall slips the windlass will fly into orbit, probably via your head! If you never put them down, they won't get left behind at a lock. There is a strong magnet attached to a length of warp, terminated by turk's head stopper knot, expertly crafted by Vicky. This provides hours of magnet fishing fun for those of optimistic disposition, it is also useful for recovering your windlass when you drop it in a lock, but NOT the aluminium Dunstan. Yellow - British Waterways utilities key: used for all public areas on the navigation, both BW and privately owned. Paddles, locks, sanitary stations, gates and doors, windlass handles, trolleys on the marina etc etc. I have one on my 'home' keyring, 'as you never know when you might need one' its very useful in London and Birmingham especially when you might need to make use of err 'facilities'! There are several sets of keys, these make travelling easier, especially when sluices are locked. I usually travel with one set permanently in the front door, this enables the door to be latched closed, but still gives easy access. The one with a float is usually kept on the hook on the engine control panel so it can easily be handed to crew. Throw coffee grounds overboard either through window or side hatch. Fairy liquid removes oil from canal waters. Bubbles accompany evening happy hour. Make use of any of the contents of the cupboards you recognise as food. Use sunflower not olive oil in wok. Switch off water pumps when leaving the boat. Red cloths are used for cleaning the toilet. Green cloths for domestic dishes/surfaces. Blue cloths for sinks, furniture etc. There are adapters to charge all known makes of mobile phone in the slots by the 12v outlet in the saloon. These plug into the 12v supply via a 'cigar' lighter adapter. Re-assemble the water tank on top, there is a knack to this, engage the front first then lower the back into position onto the lock. There is a plastic flap that needs to be in the correct place to unlock the white lever. Test the lever to see that it operates smoothly before continuing. Pour 100ml of aqua kem (blue) into bowl, 100ml is near enough the volume of the cylindrical part before the bowl flares out. Not an exact science. Put a shot of the red stuff in the flush water tank. I have never found it necessary to add water to the waste tank as advised in the manuals. Pull the left hand lever forward into the open position. Accurate posterior positioning will then ensure that everything falls straight through without touching the sides making cleaning up much simpler. Use the toilet brush when you have finished. 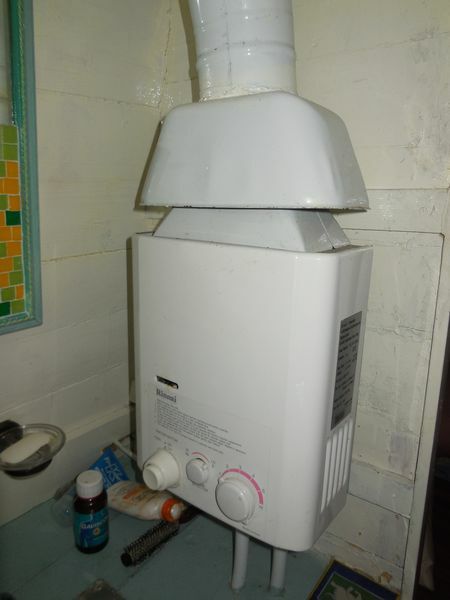 I usually run the extractor fan whilst using the shower to remove water vapour. Probably not so necessary if you are on the move with the boat open. Switch for the shower emptying pump is under the cabin top overhang on the starboard side. You turn the knob anti-clockwise to run the pump. Running the engine whilst showering will ensure that the battery does not go flat. You can use the built in supply or the small 300 watt mains inverter which plugs into boat 12v, cigar lighter outlet. Will run low power, up to 300 watt loads. Not hairdryers! Vibrators, computers, razors are ok. I have had some problems with this item which is that the mains supply it makes is very messy. This has caused the premature demise of my electric toothbrush charger so suggest you only use it on good old fashioned electronics. This runs off the domestic battery which does not hold sufficient charge to run it for a long time without the engine running. It has an isolation switch, next to the water pump switch as well as its own thermostat. Set its thermostat to its coldest setting and in normal weather, when cruising, it will remain cold enough if switched off overnight. To discourage leaving it on overnight, the switch has an annoying bright yellow led. 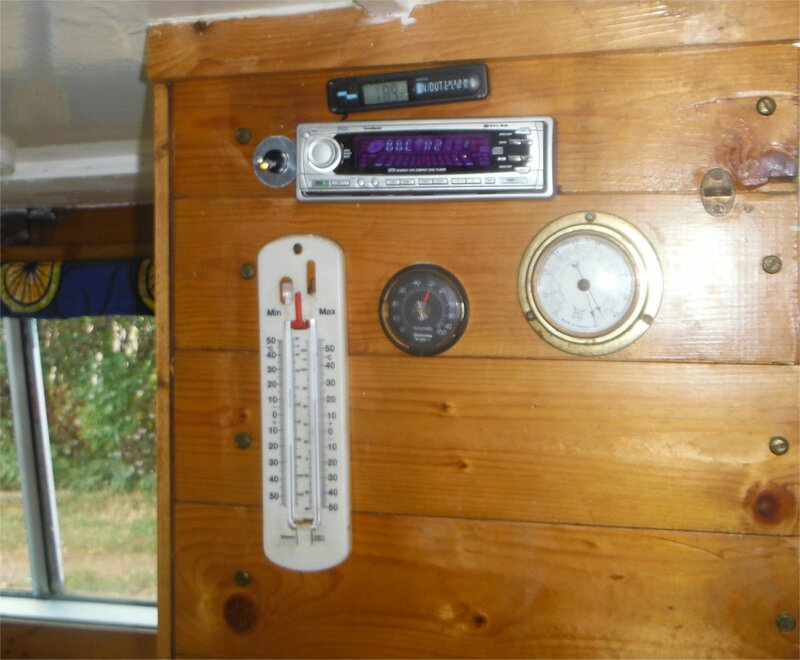 If leaving the boat for a short while, eg to go to the pub, the fridge can be left on but it is a good idea to set its thermostat to its warmest setting to reduce battery drain. If you are leaving the boat for a long time without the engine running, please turn it off. Turn the burner knob to full and press down to over ride the flame detector. Then press the red button on the hob to ignite the burner. Continue depressing the burner knob until the flame detector is warm enough to be convinced that the burner is ignited, then release. The oven and grill have separate piezo igniters. The grill switches itself off if you close the door when it is lit. Depress the knobs to hold the flame on until the flame detector is convinced that the burner is alight, this sometimes takes and annoyingly long time. [The grill is often a problem but seems to work ok the second time you light it. Usually you have to do this with an external lighter as the piezo are disabled when the burner is warm. It does not always stay lit if other gas appliances are being used at the same time. eg the gas fire. Things have been moved around a bit lately, but everything listed is on the boat somewhere!!! Torch hanging on hook set. I'm finding this quite difficult, when I lived on board, everything was to hand, now I'm just trying to maintain a stock of items that don't suffer too much when left unattended. Please make use of anything you recognise as food as it helps to keep thing current. If sell by dates worry you, better take an asprin. I have a very long warp that I use when single handing, this is also easy to use if you have crew. One end is secured to the bow ring and the other to the short length of hand rail on the port side in the stern. Care is needed in its use as there is a possibility that it can become wrapped round the prop if it is not kept under control. The consequence of this would be a stalled engine and about an hour's work under the weedhatch to free it. The large knot in it is testimony to a previous occasion when this precaution was not taken. The 'loop' of the warp is dropped over suitable bollards or the access stairs in the lock and the slack taken up either by the helm on the boat or by the single-hander on the bank. 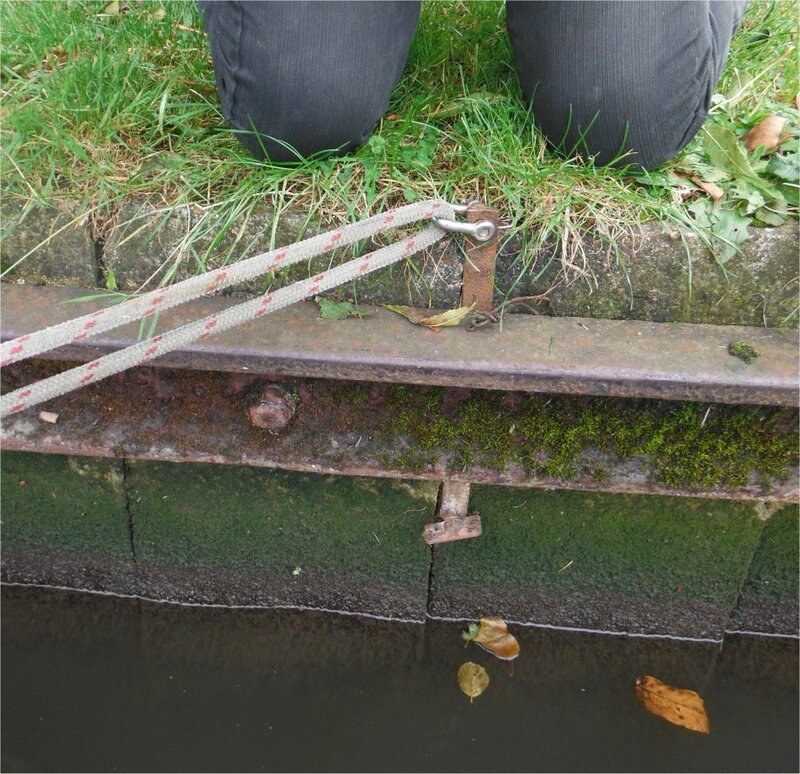 If single-handing, you will have to use the lock ladder to get on or off the boat, take care, these are nearly always slippery. Have a good look round and assess the situation. Check that there is no approaching traffic with priority for the lock, or possible dual use together. Check that all paddles are down. Keep an eye on the general public and ask them to move if they are going to be in the way or at risk. Empty the lock if necessary. Open the towpath side lock gate. Move the boat into the lock and position near the bottom gate. Pass the long warp over bollards and hold, do not tie fast. Meanwhile the crew should have closed the gate. Open the ground paddle on the same side as the boat, crack it a little to start and then open more as a flow is established, this should rebound off the far wall and pin the boat to the near side lock wall. Cross the lock and open the other ground paddle. If there are gate paddles, crack the far one a little and watch to see what it does, many of these are shuttered now and the flow of water is downward and controlled, if this is the case raise it a bit more, if not, wait for the water to rise above the outlet and then continue raising it keeping an eye on it the while to be sure it is not too much. When fully open, cross and open the other one in the same way. When the lock is full, cross to the far side again and put down the far paddles. Cross to the towpath side and open the gate. Once the gate is open, close the towpath side paddle, wait for the boat to exit and then close the lock gate. Don't close the paddles until the gate is open or leakage will be enough to prevent the gate from opening. If the bottom gates are very leaky, like Cowley Lock, leave all top paddles open, open the gate, take a long walk round to close the far top paddle, and another long walk back round to close the nearside paddle and gate. Helm flicks the warp off the bollards and moves out of the lock. As before, be aware as you take on the lock. Fill the lock if necessary, if there are no boats in the lock, no finesse is needed, just open everything up until it is full. Save time by doing all nearside paddles then crossing and doing the farside ones. When the lock is full, close the farside paddles, cross to the towpath side and open the gate. Once the gate is open, close the paddle. Position the boat ahead of the entry gate, well clear of the cill and close to the exit gate. Loop the warp over bollards but do not make secure, the boat is about to go down and the warps need to let it, helm holds them tight on the stern or the single hander controls them from the lock top as the lock empties. Open nearside paddle, cross and open the far side, once the lock is empty, close the far paddle, open the gate and then close the nearside paddle. If the top gates are very leaky you may need both paddles open to shift the gates in which case you have to put up with a long walk over the other gates. Helm flicks the warp off the bollards, a fine feat if the lock is deep and then exists the lock. A kind helm will lurk in the exit throat of the lock and wait for crew to close the gate and scramble down the stairs provided at many locks for this purpose.